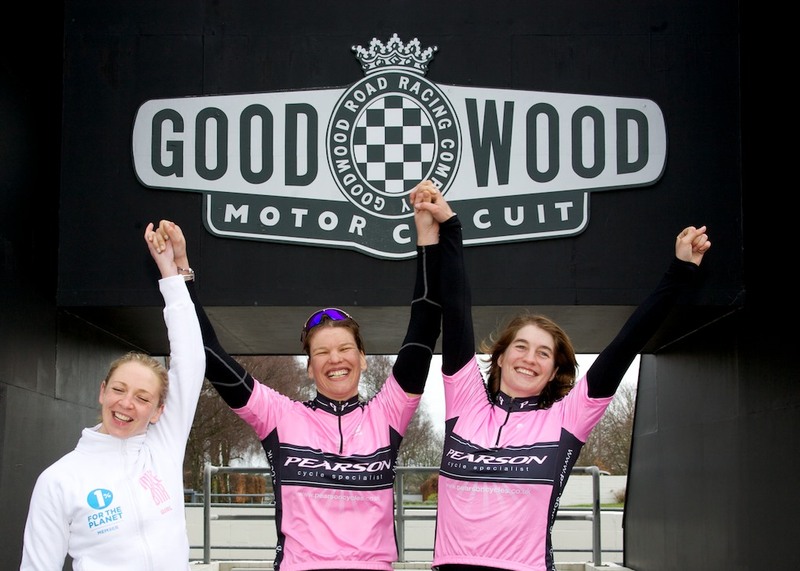 London Women's Cycle Racing: Fantastic League Opener at Goodwood! Sunday 28th March. 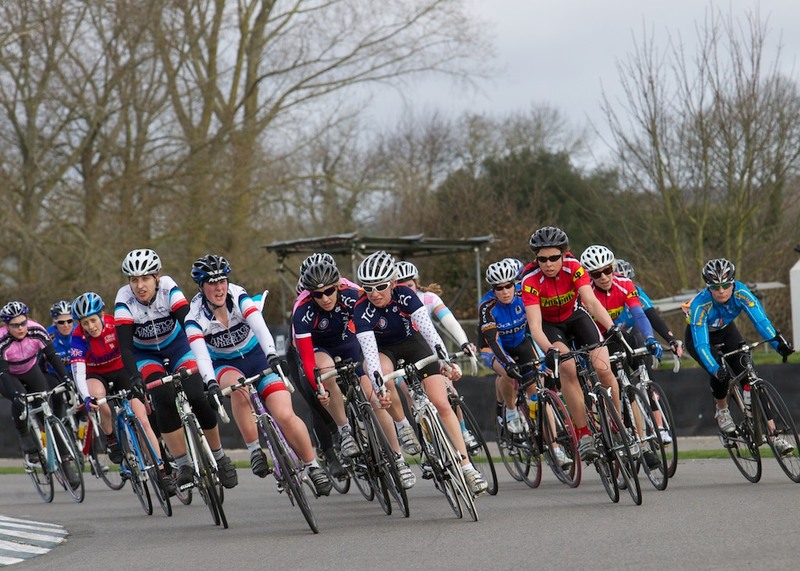 A record field of around 40 riders took the start line at the Surrey League @ Goodwood races for our opening round of the League. 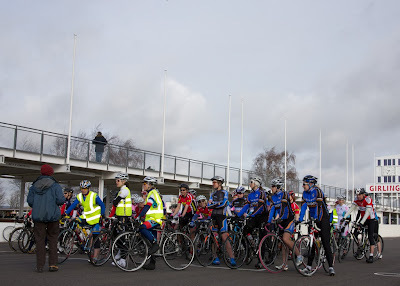 Various levels of rider raced the 13 laps and 28 miles of the historic motor circuit. While the novice riders were chaperoned around the course, the experienced racers battled it out at the sharp end of the bunch. The front group of racers from Pearson Cycles, Twickenham CC, Kingston Wheelers and others set a high pace which quickly fragmented the field into various chunks. Several women attempted to attack, in particular Rebecca Slack (London Dynamo) Lise Soerensen and Emily Bagnall (both Kingston Wheelers) but the windy conditions wouldn’t allow any successful breakaway. Coming into the final lap, the front group, now whittled down to around 10 riders still had everything to play for. With help from her Pearson Cycles clubmate Mathilde Pauls, Elise Sherwell was able to launch an intense sprint for the finish line, which proved too strong for Hannah Bowers (Team MuleBar Girls) who had been marking the ex-rower during the race. Pauls completed the podium, while Astrid Wingler (London Phoenix) who finished in fifth place, was the highest placed 4th category racer. It was a bumper day for Elise who not only donned the leaders jersey, but she also won both of the primes (intermediate sprint race). Reactions: Matt Harper (Look Mum No Hands! ): "It was fantastic to see so many girls out racing. Elise was a worthy winner and Look Mum No Hands is proud to be involved." 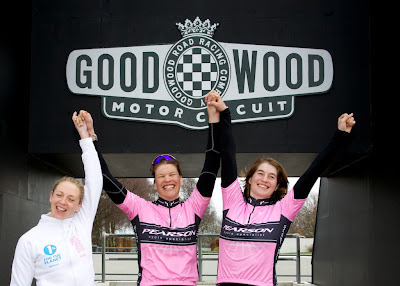 Elise Sherwell: (Pearson Cycles) "I thoroughly enjoyed my first race of the season. Although the wind was blowing, the rain was not falling, so it was a great day to have a bike race. Lots of people were working hard on the front trying to make breaks happen, but because of the wind and various other reasons these were never really successful. In the end it came down to a sprint and I dug deep to stay ahead! The next London Women's League race will have all categories so I expect some tougher competition, but I am pretty happy with winning the first ever London Women's League race." The Surrey League organisers and the promoting club, Dulwich Paragon were delighted with how the race went and were very impressed with the quality of the racing.